The homestead kitchen is a busy place. It hums with the sounds of life and activity. You will often find baskets of freshly harvested vegetables spread across the dinner table. Crocks and pails of wild crafted food, vinegar and wine ferment on counters and in different corners of the room. As you move around the kitchen you can hear the symphony of life forming as these concoctions gurgle, bloop and blurp happily. Herbs, garlic and onions hang from rafters to dry. Big pots simmer on the stove and jars sit cooling on the counters letting off the occasional ping, their telltale sign of having sealed successfully. This is the heart of our homestead. 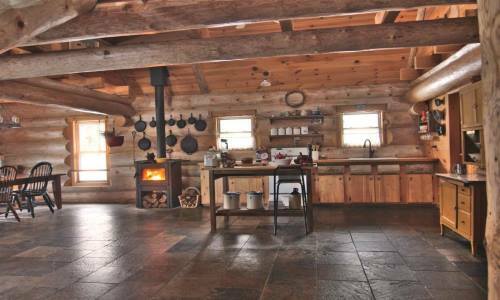 Discover what’s involved in running an efficient and organized homestead kitchen. This article shares insights into the tools used to preserve food, off grid appliances, wood stoves, cast iron cookware, pantries, sinks, cold storage and much more! Previous PostDo I Need to Dig My Vegetable Plot or Allotment Every Year?